GUANGZHOU, Oct. 25 (Xinhua) -- Chinese President Xi Jinping has called for greater resolve and stronger measures in deepening China's reform and opening-up in the new era. Xi, also general secretary of the Communist Party of China (CPC) Central Committee and chairman of the Central Military Commission, made the remarks during his inspection tour of southern Guangdong Province from Monday to Thursday. "The international and domestic environment has undergone extensive and profound changes in the new era, presenting the reform and opening-up with new circumstances, tasks and challenges," Xi said. "To seize opportunities and counter challenges, the key is upholding the banner of reform and opening-up in the new era, and continuously deepen reform and expand opening-up in a comprehensive way, " he said. Xi visited places including Zhuhai, Qingyuan, Shenzhen and Guangzhou, where he learned about the work on applying the guiding principles of the CPC's 19th National Congress, deepening reform and opening up, as well as advancing high-quality economic development. On Monday afternoon, Xi visited an industrial park for traditional Chinese medicine (TCM) in the Hengqin New area in Zhuhai, a pioneer project developed under a cooperation agreement between Guangdong and Macao. Xi called for more efforts in exploring the essence of TCM and better collaboration between enterprises, universities and research institutes to advance the industrialization, modernization and globalization of TCM. He also urged stronger policy support for deepening and expanding cooperation between Hengqin and Macao in developing emerging industries to inject more vitality into Macao's economy. Later in the afternoon, Xi visited home appliances maker Gree Electric Appliances, inspecting its independent core technology research and development department, and holding talks with research staff in a national key laboratory on energy efficiency of air-conditioning products. "The real economy is the foundation of a country's economy and source of wealth. Advanced manufacturing is one key area of the real economy and the economic development cannot be separated from the real economy at any time," he said. Independent innovation is the only way towards scaling world heights in science and technology, and all enterprises should make arduous efforts towards this direction, he said. "Enterprises should have the aspirations and guts to accelerate enhancing the capability of independent innovation, strive to achieve the independent control of key core technologies and hold firmly the initiative of innovative development in our own hands," he said. On Tuesday afternoon, Xi inspected an e-commerce industrial park in the city of Qingyuan in central Guangdong, where he was briefed on local government's efforts in poverty relief and rural reform. Xi said the unbalanced development between urban and rural areas and among different regions was the biggest challenge of Guangdong's high-quality development. "Strengthened, continued efforts and more targeted measures are needed to solve the urban and rural divide to turn weakness into potential and widen development space," he said. After leaving the industrial park, Xi came to a public service station in Lianzhang village in Lianjiangkou town where he learned about the work of strengthening primary-level Party organizations, poverty alleviation and public service for villagers. At a toy workshop, he chatted with workers and said the most direct and effective way to alleviate poverty was through industrial development. It is also a long-term plan to help create jobs for local communities. He said outstanding Party members with high quality, integrity and a spirit of fairness must be selected to lead fellow villagers out of poverty and to a comfortable life. "No one should be left alone on the road toward poverty alleviation and a moderate prosperous society. The mission should be fulfilled through work of generation by generation," he said. On Wednesday morning, in the city of Shenzhen, Xi visited an exhibition marking the 40th anniversary of reform and opening-up achievement in Guangdong. He said the "groundbreaking" changes in the past 40 years had drawn worldwide attention. "I visit Shenzhen as it marks the 40-year anniversary of opening-up and reform in order to tell the world that China will not stop its opening-up and reform. China will certainly deliver a bigger miracle that draws worldwide attention," he said. "We should stay true to our founding mission of reform and opening-up, draw on successful experiences in the past 40 years and raise quality and level of opening-up and reform. "We should be people-oriented. People's happiness should be the criteria for evaluating the result of opening-up and reform. The fruits of opening-up and reform should benefit the general public." He asked Guangdong to continue to carry forward its pioneering spirit and generate more experiences based on its own advantages, and hold the banner of opening-up and reform in a steadier and higher manner. Xi then visited Qianhai and Shekou areas of Shenzhen in the Guangdong Pilot Free Trade Zone to inspect local development. "Reform and opening-up has been proved by practice the right path which we must consistently, unswervingly and unremittingly follow," he said. Xi called for solid efforts in developing Qianhai, to provide more practical and innovative reform measures and explore more duplicable practices. He urged Shenzhen and Hong Kong to deepen cooperation to play a bigger role in building the Belt and Road, advance the development of Guangdong-Hong Kong-Macao Greater Bay Area and participate in international cooperation at higher levels. By noon, Xi arrived at a local community in Shenzhen, where he learned about public service, Party building at the grassroots and community administration. He said that more resources, services and management should be channeled to the community to provide residents with standardized and sophisticated services so that their issues, big or small, could be resolved. On Wednesday afternoon, Xi went to the provincial capital Guangzhou, where he visited the historic Xiguan neighborhood and Jinan University. After hearing a work report on Guangzhou's urban planning and construction, he pointed out the importance of protecting historical culture and highlighting local features in urban planning. 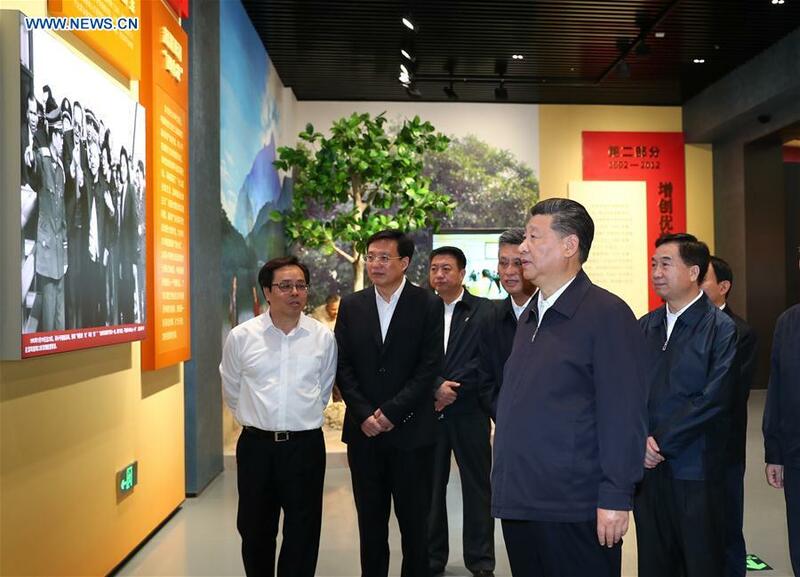 At Jinan University, Xi viewed a gallery showing the university's history and achievements and talked with students from Hong Kong, Macao, and Taiwan and those who were overseas Chinese nationals. "China's connection with over 50 million overseas Chinese nationals is a unique advantage in its development," Xi said, noting that overseas Chinese nationals should also share some credit in China's reform and opening up. Xi expressed his hope that the university faculty could better run the college and create better conditions for overseas Chinese nationals to come to the motherland to study and carry forward Chinese culture. During a visit to Guangzhou Mino Automotive Equipment Co. Ltd, Xi said private businesses had made great contributions to China's economic growth and had a very promising future. "The CPC Central Committee always values the development of the non-public sector of the economy and is supportive of them, which has not changed and will not change," he said. "We will create better conditions for the development of private businesses and small and medium-sized enterprises." On Thursday afternoon, Xi was briefed by officials of the CPC Guangdong Provincial Committee and the provincial government about their work, acknowledging the progress they had made. "The development of Guangdong in the past four decades proved that reform and opening-up is the sure way to uphold and develop socialism with Chinese characteristics and decides China's fate," Xi said. Instructing the province to deepen reform and opening-up, Xi said concrete efforts were needed to develop the Guangdong-Hong Kong-Macao Greater Bay Area, bring opening-up to a higher level and the Guangdong pilot free trade zone to a high standard. Stressing high-quality development, Xi asked the province to expand real economy, enhance environmental protection, improve people's livelihoods, and encourage enterprises to play an active part in innovation. Underlining balanced and coordinated development, he instructed the province to speed up rural vitalization, work for the coordinated development of different regions and promote rule of law. Asking the province to strengthen Party leadership and Party building, Xi said they should firmly safeguard the authority and centralized, unified leadership of the CPC Central Committee, strictly enforce political discipline and rules, adopt the right approach in selecting and appointing officials, regulate officials' exchanges with business people, and form a new type of cordial and clean relationship between government and business.